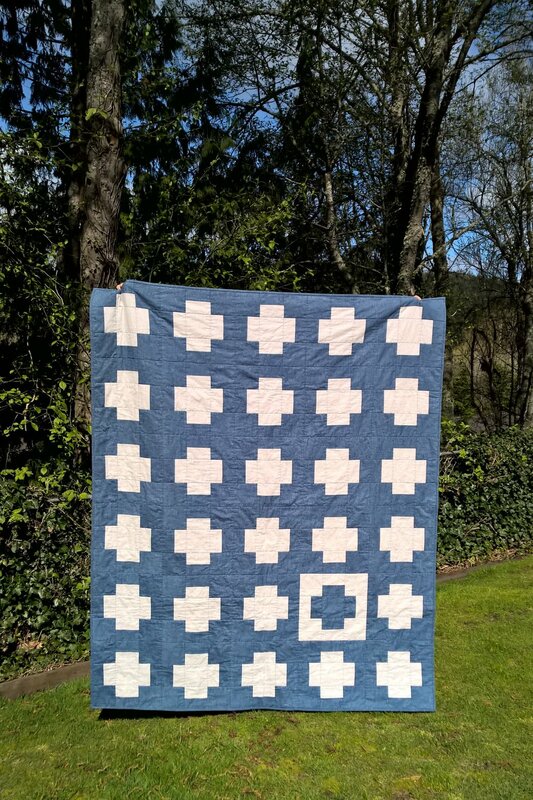 I took advantage of the sunshine this weekend to snap some pics of my latest quilt finish: "One-Off"! For the top, I used Essex Yarn Dyed in Nautical and Essex Yarn Dyed Homespun in Silver. The texture is absolutely divine! I know some folks can be a bit skeptical about linen, but I've got to tell you, they've never given me a moments trouble. I don't pre-wash (because I like my quilts to crinkle) and I don't have any trouble with fraying. These are heavier than quilting cottons, so I chose to quilt in-the-ditch along seam lines creating a 4"x4" grid. 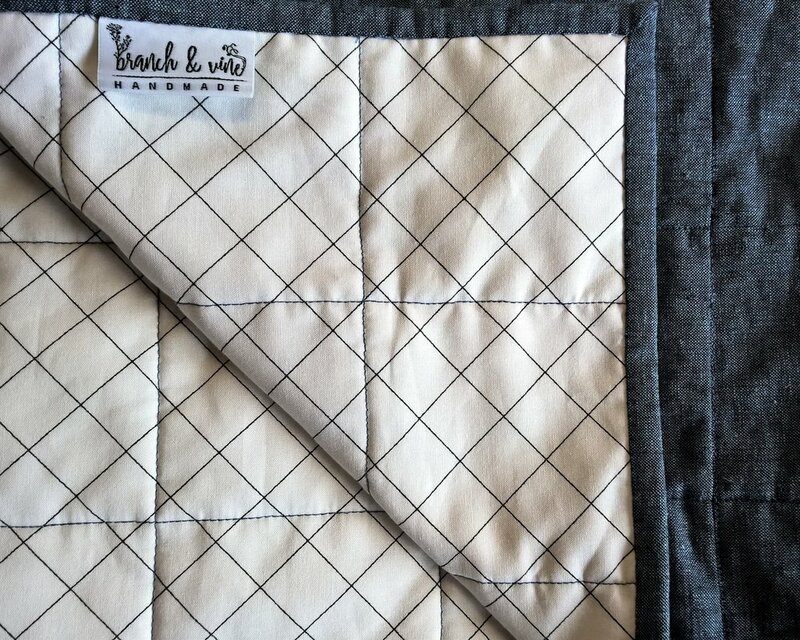 This gives the quilt a softer drape and keeps from adding to the weight that more dense quilting would create. I also used the yarn dyed in Nautical for the binding, which is a bit more cumbersome to hand stitch the binding. She is a generous lap-size at approx. 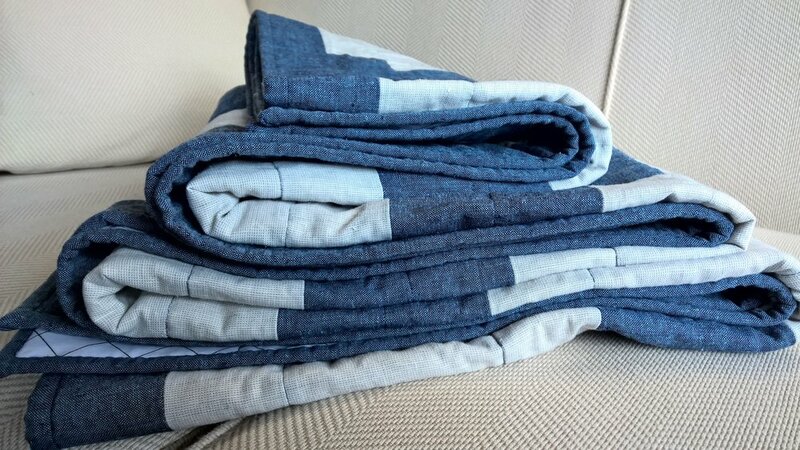 56"x68", just right for sofa snuggles or keeping at the foot of the bed. Here she is after a spin in the washer and dryer to give her a nice crinkle. Doesn't she look right at home here on my bed? 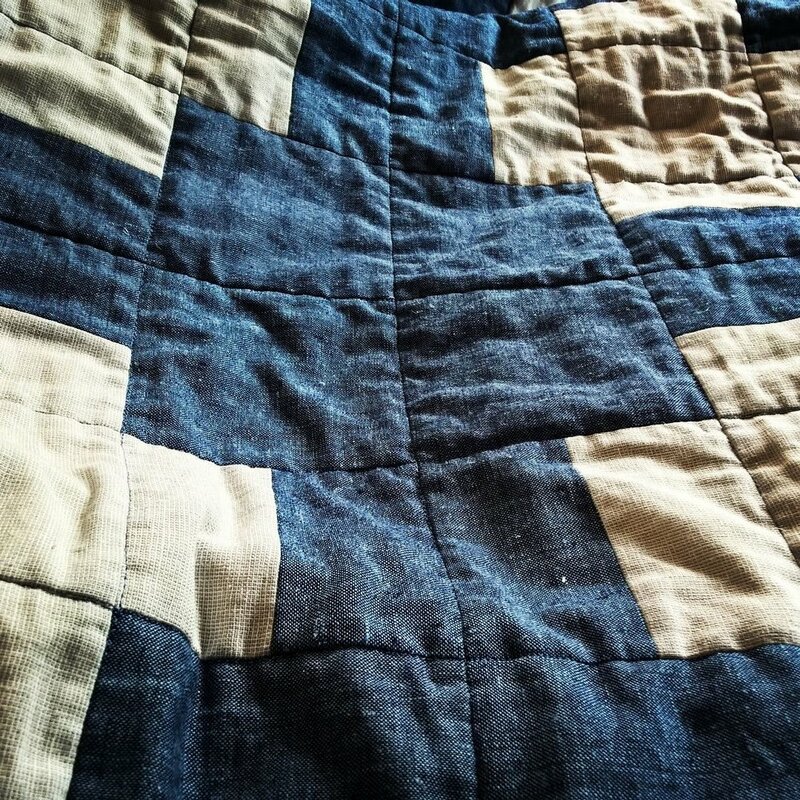 Quilting, for me, is very much about process. I gravitate toward styles and color combos that are pleasing to me during the process of making. 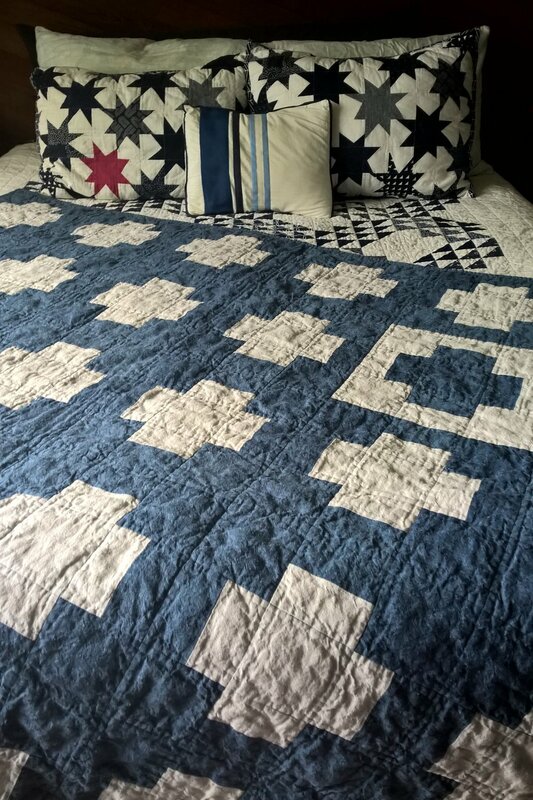 I have come to realize that the quilts made by others that I am drawn to tend to more simple, graphic, and use fewer colors... Although I like the finished product, I usually find the process less enjoyable (or perhaps stimulating is the more appropriate word). I realize I need to push myself out of my routines and habits, so I challenged myself to make a quilt with a goal of loving the final product and not focusing so much on the process. To my surprise, I actually found the process quite soothing and meditative. Since every block is identical (with the exception of one), I could find a zen sewing rhythm; no overthinking, no second-guessing, no staring at the design wall and endlessly shifting pieces. How about you: do you create with an emphasis on the final product or do you focus more on the process? Quilting up close! Quilted in the ditch along seam lines in a 4"x4" grid. This quilt is now listed for sale in my Etsy shop. I'll be bringing "One-Off" along with an assortment of baby quilts, bags, and pouches to sell at the Happy Valley Craft Fair (Happy Valley Elementary School, 1041 24th St., Bellingham WA 98225) on Friday, April 27 from noon-8pm. If you are local to NW Washington, I hope you'll come check it out and support local makers!